Play video Who are Webber's top five drivers?Who are Webber's top five drivers? Play video Who are Webber's top five drivers? Right it is time to call time on our coverage of a day of practice that will live long in the memory. Actually, no it won't because it was rubbish. I'm off to follow Felipe Massa's lead, so I'll point you in the direction of Andrew Benson's report from FP2 and we'll be back at 09:00 BST for build up to final practice. With little done today, tomorrow does at least promise to be a bit more hectic. Join us then. It was more eventful off the circuit today than on it, with Red Bull's future in F1 once again under the spotlight. The team are finalising a split from engine partner Renault but have been unable to secure a replacement on terms that satisfy them. Mercedes have refused to supply them and Ferrari will not sell them their definitive 2016 engines next year. Ferrari are offering 2015 engines but Red Bull want parity of performance. Clearly it is an unnatural thing for Daniel Ricciardo not to smile, so much so that he has to force a frown. That session was not much fun for the Australian, just one lap completed in 90 minutes. Felipe Massa snatches the honour of being the fastest driver at the end of a rain-affected FP2 with 2:00.458. Felipe Massa finishes fastest in second practice for the Russian Grand Prix. One minute left but Mercedes have called time on their practice session, Manor do likewise. Meanwhile, Valtteri Bottas looks set to finish with the fastest time as he climbs into P1 with a 2:00.688. Sebastian Vettel, sixth fastest of the eight drivers to complete timed laps, runs wide just before the chequered flag comes out. After his frustrated radio messages in Japan, it is a brave person who tells Fernando Alonso of a potential problem with his McLaren. Someone has to do just that, though, as he is told: "We have a problem. Box." Felipe Massa grabbed 40 winks earlier and, refreshed and raring to go, he heads out for the first time this afternoon. Daniil Kvyat's first timed lap of the session - 2:01.418 - sees him slot into P3. Like in Japan, things are being set up for a very frantic final practice session tomorrow as teams look to make up for lost time. Into the final 10 minutes and the two Red Bulls head out for some late laps. Meanwhile, Jenson Button becomes only the fourth driver to complete a timed effort with a 2:06.749. As a Leeds native myself I like this design. Eleven of the 20 cars have been out on the circuit with 15 minutes remaining of the session. Just as it looked likw the rain had passed, it falls again as Nico Hulkenberg has a little wobble, briefly losing his rear before recovering. The rain is getting heavier. It looks like Max Verstappen's 2:00.806 is on course to stand as the fastest time of this session. Carlos Sainz gets caught out by the wet surface as he runs a little wide coming out of Turn 17. No major drama as he rights himself and gets back on his way. Max Verstappen puts down his best lap of the session so far as a 2:00.806 sees him up into P1 before he pits, leaving Carlos Sainz briefly alone on the circuit before Sergio Perez joins him. Max Verstappen's Toro Rosso team-mate Carlos Sainz gets his name on the timing board with a 2:03.805, briefly popping him into P2 before Verstappen goes 1.5s faster. The sky is a bit brighter above the circuit, but some of the track still look very wet. Max Verstappen is out and sets the second fastest lap of the afternoon, a 2:04.858 which is 3.8s off Fernando Alonso's time. Busy, busy, busy! Daniil Kvyat gives the home fans something to cheer about as he becomes the seventh driver to head out on to the circuit. Jennie Gow has caught a word with Romain Grosjean, who is competing in his final few races at Lotus before joining new team Haas F1 next season. How has he found the day so far? "Boring. The rain came just before FP2 so we did a selfie with the team, we discussed the track but it looks like one part is wet so no point running. We'll just have to wait and do all the work on Saturday morning." Is the title out of reach for Nico Rosberg? Not mathematically, but it is looking increasingly unlikely as he trails Lewis Hamilton by 48 points with five races remaining. The circuit briefly falls silent as Fernando Alonso and Valtteri Bottas head in, but Nico Rosberg decides to join the fray for the first time this afternoon and give the patient Sochi crowd something to cheer about. Fernando Alonso continues to put some laps in and lowers his best time to 2:01.077. Meanwhile, Valtteri Bottas provides feedback on his stint on the track: "It is quite tricky conditions Turn 12 to the exit of Turn 1 is quite wet." We have a time on the board! A very tentative 2:05.599 from Fernando Alonso but the clouds are clearing and Valtteri Bottas decides it is time to have his first venture on the circuit. “Fernando Alonso ran a new-spec Honda power-unit this morning, with an upgraded internal combustion engine, as well taking the opportunity to change the engine's control electronics, turbo and the MGU-H, the electric motor that recovers energy from the turbo, all of which were of the same specification apart from a small reliability change to the turbo. That added up to a 25-place grid penalty for using more than the permitted number of parts. Fernando Alonso decides to head back out and as we follow his McLaren round the circuit it is definitely really quite dry in some parts. You would hardly know it had been raining, that is until he comes round the final corner and water sprays up behind his car down the start-finish straight. As Sebastian Vettel reports, it looks like half of the track is reasonably dry, with the other half very wet, making it tricky conditions for any tyre. All quiet on the circuit again as Sebastian Vettel and Fernando Alonso head back in after that initial recce. With 30 minutes of the session gone, Fernando Alonso gives Sebastian Vettel some company on the circuit as the Spaniard asses the conditions. Vettel feeds back his report to Ferrari, saying: "There is quite a big difference in terms of standing water. From Turn 13 to Turn 2 there is quite a lot of water and from 2 to 13 it is only damp." Tom Clarkson has caught a word with Mercedes team boss Toto Wolff, and asks him about the possibility of Mercedes supplying Red Bull's engines for 2016. "The situation has not changed from a few months ago," he said. "That is we have decided not to pursue that option. We are not set up to supply previous year engines, so we could not do that. "There are other suppliers. I am not in Red Bull and not aware of any discussions. Red Bull are a very important part of Formula 1. The situation needs to be solved but we are all in charge of our own destinies." Movement! Sebastian Vettel breaks the silence and heads out on to the circuit with full wet tyres bolted on, a huge spray kicks up behind his Ferrari as he does so. Lewis Hamilton was in dominant form on his way to victory at the inaugural Russian Grand Prix last year. He won't be able to match his 2014 record, however, having managed just the seventh fastest time in first practice. With not much happening on the circuit, thank goodness for your track designs! The running this afternoon will probably be reasonably limited. There is an element of the unknown when you lose as much running as this but what it means is that in practice tomorrow you will try and cram as much running in as possible to try and get an idea for the rest of the weekend. The rain is still falling but Jennie Gow suggests the current clouds could be set to move on within the next 10 minutes. Jenson Button, by the way, will be back in a Formula 1 car in 2016, but it has not stopped him from having a dabble at other forms of motorsport. He recently swapped his McLaren for a 600-horsepower VW Beetle rallycross car, and you can watch how he got on here. Jenson Button's cockpit is protected from the elements by an umbrella as the McLaren is wheeled out of the garage. That's a very wet-looking pit lane. The track is open but, unsurprisingly, there is no movement as the rain continues to come down. Waterproof ponchos are being put on and umbrellas swiftly put up in the stands at Sochi because the rain has just got a little heavier. Fernando Alonso provided much of the early entertainment in first practice with some good laps, but he goes into this weekend having already accumulated a 25-place grid penalty. Honda have invested their four remaining 2015 engine development tokens on revising their engine for this weekend's race. Alonso's McLaren team-mate Jenson Button escapes any penalties for Sochi because there were not enough updates for his car. Roberto Merhi is also hit with a grid-place penalty, taking a 20-place drop thanks to some unscheduled changes to his Manor's engine. This may be Daniil Kvyat's home race, but the actual circuit is located a fair old distance away from where he is from. His home city of Ufa is 1,700km away from Sochi - the equivalent distance of Rome from London. James Macdonald here raising the stakes with this detailed circuit design. Red Bull sticking with Renault? “Well, what an unholy mess Red Bull find themselves in over engines for next year. The latest development in a long-running saga is that team boss Christian Horner has told Germany’s Auto Motor Und Sport that Ferrari are prepared only to supply engines to Toro Rosso and not Red Bull next year. Which leaves Red Bull without an engine. "Technically, they have a contract with Renault until the end of next year, but privately both organisations had made it clear over the last few weeks that the relationship was over - a decision that was reached during the summer. However, Mercedes made it clear last month they were not prepared to supply them. So, assuming the Ferrari information is true, Red Bull are in a bit of a bind. Missed first practice? You can watch the highlights here. Second practice is set to get under way at 12:00 BST and will last for 90 minutes, and you can watch it on Red Button. If you tune into BBC Two expecting to watch it, you'll most likely end up with 1980s detective Jim Bergerac pulling facial expressions displaying mild exasperation on your television screen. Hello and welcome to our coverage of second practice for the Russian Grand Prix. There was not much running in first practice after the diesel spill, and signs are not great that we'll see much more this afternoon. No rain is expected this weekend and, at the moment, dark, foreboding clouds are looming large over the circuit, with rain expected to fall sometime during the session. With Lewis Hamilton suggesting in his latest BBC Sport column that he would like to have a go at designing a circuit, we have been asking for you to send us sketches of your dream circuit, and let us know where it would be, via #myidealcircuit. Can't send us picture? Not to worry, we'll still welcome your descriptions of your ideal circuit via text on 81111 (UK only) and on the BBC Sport Facebook page. The Russian Grand Prix weekend got off to an unusual start as a diesel spill from a sweeper truck hampered teams' running in first practice. It resulted in an unfamiliar outcome, Nico Hulkenberg topping the session and Lewis Hamilton - dominant throughout the race weekend in Sochi last year - spinning late on. With the diesel spill (hopefully) long since dried, will FP2 have a more familiar feel to it? Progress on Red Bull's engines for 2016 [see Lee McKenzie's entry]? We'll see if there is more on what was said in that meeting when we return for build up to second practice at 11:30 BST, with the session itself getting under way at 12:00. "When we were speaking to Christian Horner about 90 minutes ago he was meant to go on to the pitwall, he was taken into the Red Bull hospitality by Bernie Ecclestone and they have just finished talking. It was Christian, Helmut Marko and Bernie in a big meeting. When Bernie came back out he gave David a nod, a wink, and a thumbs up." So Nico Hulkenberg nicked it at the last, pipping Nico Rosberg into P1 with a 1:44.355, 0.052s faster than the Mercedes. That's the first time this season Hulkenberg has topped a practice session this season, although it was an unusual one after it was delayed by an early diesel spillage by a track sweeper. What will the teams take away from that? Not a lot. It will be a pretty frantic second session. Nico Hulkenberg finishes fastest in first practice for the Russian Grand Prix. Sebastian Vettel improves with a 1:44.986, with Nico Hulkenberg into P2 with 1:45.091s. Meanwhile, Lewis Hamilton watches Felipe Massa spin in front of him, avoids the Williams, but spins himself soon after. McLaren appear to be handling the conditions well as Fernando Alonso reclaims P1 with 1:47.443 after a brief spell on top from Valtteri Bottas. Problems for Marcus Ericsson, though, with his Sauber being wheeled back from the exit of the pit lane. "Every time I restart it, it stops," says Ericsson. Now Fernando Alonso goes fastest with 1:49.240 but it is an ever-changing timesheet as Valtteri Bottas moves into P2, ahead of Nico Hulkenberg. Twelve times on the board as drivers finally get some proper running in as we head into the closing stages of first practice. It is currently a McLaren one-two as Jenson Button leads from Fernando Alonso, who has just gone second fastest with a 1:51:036. A brief flutter of the yellow flags as Sebastian Vettel and then Kimi Raikkonen run wide at Turn 8, the Ferraris struggling with the conditions there. Jenson Button posts the fastest time on a three-car timesheet. a 1:50.920 on the soft tyre as his McLaren team-mate Fernando Alonso falls foul of the slippery conditions at Turn 8, running wide. Meanwhile, Carlos Sainz and Kimi Raikkonen are also now on the soft tyres as we approach the final quarter-of-an-hour of this session. Quote Message: At the moment it is not heavy but we just need to keep our eyes open. Add some rain on top of some diesel on a wet track, that's not going to go well. At the moment it is not heavy but we just need to keep our eyes open. Add some rain on top of some diesel on a wet track, that's not going to go well. With just under 25 minute to go, Marcus Ericsson is only the second driver to put a time on the board with a 1:55.402. Quote Message: We don't want to destroy our inters, and there is no point running on slicks at the moment because the track is half wet. It is looking like that. I think they are predicting a lot of rain around 2:30pm. A two day grand prix will be fun anyway. from Daniel Ricciardo, who is not in his Red Bull at the moment. We don't want to destroy our inters, and there is no point running on slicks at the moment because the track is half wet. It is looking like that. I think they are predicting a lot of rain around 2:30pm. A two day grand prix will be fun anyway. Daniel Ricciardo, who is not in his Red Bull at the moment. Shades of Japanese Grand Prix practice at the moment with Friday, so far, proving uneventful because of the conditions - the track is still a little slippery after the diesel spillage from earlier. Not much for teams to learn, with qualifying and the race itself set to be dry. Fernando Alonso shaves a few seconds off our sole timed lap of the session, improving to 1:53.854. Alonso and Marcus Ericsson are the only drivers out on the soft tyres, everyone else on inters. "It is really slippy," says Ericsson. We have just been treated to a slow-mo of Fernando Alonso's McLaren kicking up a few sparks as he circulates the track. The Spaniard sets the first timed lap of the session, an unrepresentative 2:00.736. Where did those blue skies go? Good dedication to the topic here, with crayons being brought into play. "I can still do better so can I do it again," asks Nico Rosberg, as he spends the early part of this session indulging in some practice starts. "You can do another start Nico," is the reply. No timed laps with 15 minutes of the session gone, but all 20 cars have been out for an installation lap as they test the conditions after this morning's diesel spillage. Oh, a little moment for Valtteri Bottas as he slides a little wide in his Williams on his way back into the pits. Both Bottas and his Williams team-mate Felipe Massa are the only two drivers to opt for wet tyres. Roberto Merhi is back in the seat for Manor, with Alexander Rossi popping back to GP2. Rossi and Merhi are sharing driving duties for the final few races of the season, with Rossi having raced in Singapore and Japan. Merhi will compete this weekend, as well as at the Abu Dhabi GP, and he has been out for a check of the conditions this morning. Quote Message: Sebastian Vettel: "What a mess"
Sebastian Vettel: "What a mess"
"Ideal circuit, you say? That’s easy. Suzuka - perhaps with the original 130R. Full stop." At last! Some track action as practice gets properly under way, Marcus Ericsson heading straight out on to the circuit. He is on inters, with the track having been declared wet. The drivers will only have one hour of first practice, after that diesel spillage wiped out the opening 30 minutes. With Lewis Hamilton sayingin his latest BBC Sport columnthat he would like to have a go at designing circuits, we have been asking you to send in your designs to#myidealcircuit on Twitter. Just joined us and wondering why I am rambling away and not talking about what's happening in practice? That's because no-one is out on the circuit at the moment because a track sweeper spilled a fair bit of diesel while doing its duties this morning. “As for the other McLaren driver, Fernando Alonso also left Japan with uncertainty surrounding his future after, despite having a three-year contract, he said in a post-race interview with the BBC that he ‘didn’t know’ whether he would be in F1 next season. "He put out some tweets in an attempt to clarify the situation later that evening, but that did not stop it being the item number one on the agenda in the official news conference on Thursday. The tweets were not completely clear, he was asked, will you be in F1 next year? ‘You didn’t read the tweets?’ Alonso said. I read them, his questioner persisted, but they weren’t totally clear. “One way and another, the McLaren drivers have been in the news since the last race in Japan. In Jenson Button’s case, it was announced that he would be staying at the team in 2016. Button admitted he had given some - if not much - thought to retirement, but said that the key to wanting to stay was in being convinced he would not face another season as trying as this one. Quote Message: This will definitely impact when they get out there in terms of doing meaningful testing. It will compress everything. This will definitely impact when they get out there in terms of doing meaningful testing. It will compress everything. Max Verstappen, by the way, is finally able to drive a car on normal roads, having passed his driving test on his 18th birthday a few days after the Japanese Grand Prix. It also means he can have a sip of the champagne, should he get on the podium. What's the latest at Red Bull? “Five races to go, and it is still unclear whether Red Bull and its junior team Toro Rosso will even be taking apart in Formula 1 next year. Discussions with Ferrari over an engine supply - following Red Bull’s own decision to split with Renault and Mercedes’ refusal to sell them their engines - have stalled and the next step is unclear. Red Bull’s Daniil Kvyat and Toro Rosso’s Carlos Sainz both said they trusted the team to make the right decision. In today's world the simulation tools are so strong teams are turning up pretty much sorted. It is an inconvenience but doesn't have a major impact. There may be no cars on the track but our coverage is now live on BBC Two and online, Lee McKenzie is currently chatting with Red Bull team principal Christian Horner. Quote Message: Apparently it is one of the sweeping trucks that has been out there that has spilled a whole load of diesel on the circuit. The word we are getting at the moment is that they will extend the session, so we will just a smaller gap between the two sessions. Apparently it is one of the sweeping trucks that has been out there that has spilled a whole load of diesel on the circuit. The word we are getting at the moment is that they will extend the session, so we will just a smaller gap between the two sessions. Delay or not, the show goes on on BBC Radio 5 live sports extra. 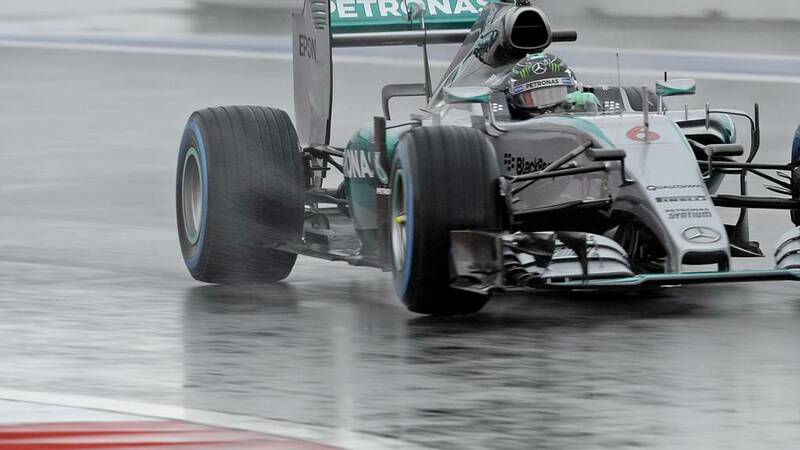 Tune in now, and listen online via this page, for the Russian GP preview show. Lewis Hamilton fancies a crack at designing his own circuits, which provides a nice little segway to our discussion topic for today. Not got access to Twitter? Then you can still let us know where your ideal circuit would be and what it would feature via text message on 81111 (UK only) or on the BBC Sport Facebook page. "Sometimes I think when I retire I will start designing tracks myself and give Hermann Tilke some competition - I've raced and I know what drivers like in circuits,"he writes. "I feel that quite often the new generation of tracks don't grasp the true essence of F1. I know there are restrictions to do with safety and so on but the circuits often feel too calculated." Just woken up? Then what better way to start the day than with a bit of Formula 1 on the tv? Coverage of first practice is live on BBC Two from 07:55 BST and if you have got to get in the car or on the train to travel to work then fear not, because it is also live on BBC Radio 5 live sports extra too. You can also watch and/or listen online at the top of this page. “Mercedes were as stunned as anyone when they were going through the struggles in Singapore that left them well over a second a lap off the pace. Since then, they have looked at what went wrong and concluded they think they understand it - a combination of a track where they had their least competitive showing in 2014, and failing to operate the tyres correctly. The soft and super-soft tyres are the choice in Russia, as they were in Singapore. And the asphalt is low abrasion, as it was in Singapore. “Lewis Hamilton is inching towards a third world title that could, if results go his way, be won as early as the next race in the US in two weeks’ time. Whenever it happens, it seems inconceivable that this is not how the season will end. "Even more inconceivable is that Mercedes will not win a second consecutive constructors’ title - they need to score only three points more than Ferrari in Russia this weekend to achieve it. "On the balance of the season, that should be easy. But we only have to look two events into the past to know that there is no such thing as a sure thing in Formula 1. Hello and welcome to our coverage of practice for the Russian Grand Prix, round 15 of the 2015 season. A title can be won this weekend, with Mercedes able to clinch the constructors' championship. Lewis Hamilton continued his stride towards the F1 drivers' title with a comfortable victory in Japan last-time out, but he knows it won't be quite so simple this weekend. Mercedes have been a dominant force at almost every circuit this season but struggled in Singapore. With the Russian Grand Prix track surface sharing similar characteristics to Marina Bay, could a slip-up in Sochi be on the cards?